Every March, masses of hungry fast-food fanatics search endlessly for their favorite brain-freeze inducing treat. A minty milkshake you say? 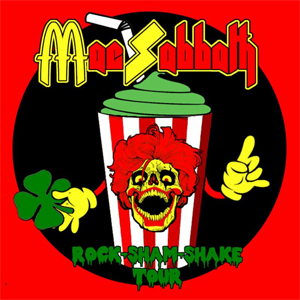 No, we're talking about MAC SABBATH - bringing the deliciously disturbing "Rock-Sham-Shake" tour to your town this March! As if they didn't get enough frosty coolness from this year's massive blizzard, the tour will frost over the majority of the eastern U.S., beginning down in Dallas, TX on March 3rd. See below for a complete listing of confirmed tour dates. Show attendees should be prepared to partake in the fun - MAC SABBATH puts on a theatrical, multimedia stage show - complete with a smoking grill, laser-eyed clowns, bouncing burgers and many more magical surprises... basically anything and everything an unwary show-goer could ever want in their wildest dreams.